A QRD diffuser comprises wells of different depths, causing a mixture of phase shifts that diffuse reflected sound. They are used to control reflections in the listening environment, particularly from rear walls and first-reflection points. Information on QRD diffusers is piecemeal and scattered across many sites and forums on the Internet, making it difficult for those who would like to know more about these devices. This page provides both a stand-alone overview of QRDs and a technical reference for the QRDude calculator. Google books has a link to the book. Understanding the book is very much a work-in-progress, and such, the content of this page, and the capabilities of the QRDude calculator, will change over time. Bringing all the information together and explaining the principles in layman's terms, using plenty of drawings. When a QRD panel is used stand-alone, the phase shifts introduced by the wells produce concentrations of energy in given directions. The interraction of these produces a complex diffusion field that becomes increasingly difficult to model as the number of wells is increased. The QRDude calculator shows a 'scattering' drawing to help visualise this, but doesn't compute the actual angles. When multiple panels are used, constructive and destructive reinforcement between the reflections from each panel produces lobes of concentrated energy at known angles. These lobes take precedence over those generated by the individual panels, and can be computed. The QRD formula ensures that these lobes are of equal energy at multiples of the design frequency. These special frequencies can be thought of as the "true diffusion" frequencies. At other frequencies, the lobes will vary in intensity. It is this 'equal energy' aspect that is the QRD's main claim to fame. The QRDude calculator has a Lobes screen that allows these lobes to be modelled for incoming signals at varying angles. The squared portion of the equation determines the phase shift introduced by each of the wells and the mod operator keeps the shift within the range from 0 to 360 degrees. Raising a number to a power is known as a Quadratic operation. Applying the modulus operator divides a number by the modulus and only keeps what's left over, known as the Residue. This explains why the design is called a Quadratic Residue Diffuser, or QRD diffuser for short. As an example, here are the depths for the popular N7 panel. The following drawing illustrates how the mod operator keeps the phase shift from the wells within the range 0 to 360 degrees (at the design frequency). The boundaries that are multiples of one wavelengths are shown as dark horizontal lines. In terms of build depth, the N7 panel is the most economical of the standard panels, meaning it is the one you will most often find for sale. Just for a bit 'O fun, here are the first few standard panels showing how the profiles and build depths change. Drawn to scale with half-width end wells (discussed in the QRDude user guide). This is equivalent to moving the well bottoms down the number of depth units specified by the constant V. When this process causes a well to reach the full design depth, the mod operator forces it to revert to a zero-depth well. The relationship between adjacent wells changes, meaning a new panel is born. More significantly, the build depth is often changed. It was the desire to investigate this phenomenon that lead to the development of the QRDude calculator - see the user guide for much more information on this topic. This becomes clearer if the panel is drawn so that the thickness of the floor plates and backboard can be seen. The following drawing shows three different ways to build an N13+4 advanced panel. 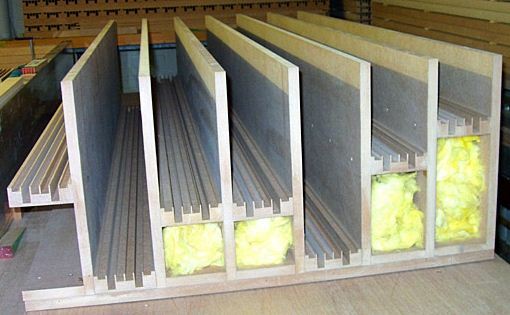 If a ply over styrofoam core method of construction is used, the height of the cores depends on the backboard option used. This can also be seen in the above drawing. For the third option, the core heights equal the block heights as listed by QRDude. For the first two options, the core heights equal the listed block heights minus the floor plate thickness. These adjustments need to be done manually. This principle works by treating points on the surface that is reflecting the wave, as new transmitters. A series of concentric circles can be drawn around each point, where each circle represents the peak of the wave. Because the panel operates using phase shifts, rather than resonances, the panel can be shallower than half the wavelength of the design frequency. Since the panel used in this example has 7 potential depth levels, (not all used), each successive level adds a delay of 1/7th of a wavelength	at the design frequency. The second well introduces a delay of 1/7th of a cycle, so it's inner circle is drawn with a radius of 60pixels. The resultant wavefront shows how a wave approaching the panel from head-on will be reflected. The arrows show the new directions. As the frequency of the signal changes, the relative phase shifts between the wells also change, meaning that the diffusion directions change. This is only for the incoming signal straight-on. For other angles of incidence, the HF cutoff is decreased, falling	to zero for a signal striking from side-on. The following drawing has three pictures, each of a signal striking one well of a QRD diffuser, with the dotted lines indicating the direction of the incoming signal. The amount of adjustment depends on the angle of incidence. When the angle reaches +/-90 degrees, the HF cutoff falls to zero, meaning no diffusion. Period width is the width occupied by the wells plus the same number of fins. It doesn't include any framing or the additional end fin needed with a stand-alone panel. The period width has to at least equal the wavelength of the lowest frequency diffused , ie the period width needs	to be at least double the design depth. For most panels, QRDude sets the well width to meet this requirement. If the well width is too small the signal is degraded by viscous losses. It was originally thought that these losses were due to friction between the moving air and the narrow walls. For panels deeper than 400mm, the minimum well width should be equal to the build depth divided by 16. The QRDude calculator uses this 2-step rule to find the viscous limit. The wells should be narrow in relation to their depth. Whilst this would make the wells as wide as the design depth, which is obviously too wide, it does show that wells can be wider than the minimum one inch limit. The QRDude calculator does not currently impose a maximum well width. Lower-order panels generally have their well widths defined by the period width requirement. As the panel order (number of wells) increases, the wells can become narrower, giving improved bandwidth, until the viscous limit is reached. It's interesting to note that until the viscous limit is reached, panel size remains much the same for the different orders. In practice, well widths are usually tweaked up or down slightly to give a standard panel width, for physical compatibility with other acoustic products. An example of this tweaking would be fitting an N13 panel into a one foot wide panel, meaning that the well widths would be a bit under the one inch limit. The potential excessive viscous losses could be mitigated by ensuring that the panel is not too deep. One supplier that uses this arrangement limits their panel depth to three inches. The wells in any QRD panel have depths that are multiples of half the design wavelength divided by N (the number of wells). If the panel is asked to deal with a frequency that is the design frequency times N, something interesting happens. This signal will have a wavelength that is 1/N of the design wavelength. For all wells, the signal will be shifted by an exact multiple of it's wavelength. In other words, they are all in phase, so no diffusion occurs. The panel is acting as a flat plate and just reflecting the signal. This represents a hard upper limit to the panel. For a typical N7 panel with a design frequency of 500hz, the plate frequency will be 3500hz. Below the design frequency, diffusion no longer occurs, but it is generally accepted that scattering is available down to one octave below the diffusion limit. For diffusion to occur, the wavelength of the lowest frequency diffused must be no larger than the period width of the panel. If this rule is not met, then the lowest frequency diffused is the frequency that does fit into the period width. This frequency is referred to as f_period, and the new scattering limit becomes one octave below this. The usable range for the panel runs from the start of the scattering range, up through the diffusion range, ending at the HF cutoff frequency. The QRDude Usable ranges explorer is accessible from the 'explore' link located at the right of the frequency ranges field on the main screen. Use it to visualise the ranges, and to see how the HF cutoff frequency changes with the angle of incidence of the incoming signal. For the interferrence patterns to fully develop into a diffuse field, it is recommended that the minimum seating distance be three times the longest wavelength diffused. For multiple panels, the lobes screen displays a revised seating distance that a based on the frequency at which the lobes start, provided this is within the usable range of the underlying panels. This takes into account the situation of lobes that are energised via the scattering range of the underlying panels, as well as the effect of signal angle changing the lobe starting frequencies. Multiple panels are required for the QRD to achieve equal energy lobes (four or more panels are recommended), however as the number of panels is increased, reinforcement leads to narrower and stronger lobes. This topic is covered in the chapter entitled The curse of periodicity in the book : Acoustic absorbers and diffusers: theory, design, and application By Trevor J. Cox, Peter D'Antonio, considered to be the bible when it comes to QRD diffusers. They advise that the excessive lobing can be offset by modulating the sequence via the introduction a second style of panel, positioned as per the Barker code. Where there is a +1 in the sequence, use your standard panel. An inverse panel is one that inverts the well depths. For example, with an N=7 panel, 0 becomes 7, 1 becomes 6 etc. etc. This is the best solution, and is the one you would use if you were custom treating a large space, such as an auditorium or church. A standard inverse panel takes up the full design depth, and so will be deeper than the normal panel, although advanced panels can overcome this limitation. If your panel is square, rotate it sideways by 90 degrees, so the fins are horizontal instead of vertical. This is the most common solution. You can also do this with a pair of half-width panels. For the rotated panel, the amount of delay depends on the angle of the signal striking the panel. When the signal is approaching across the fins, or from head-on, the panel will diffuse as expected. When the signal approaches parallel to the fins, the diffuser acts more like a normal wall. For this reason, rotated panels are of more use on end walls, than they are at the first reflection points on side walls or roofs. It seems that actually modulating periodic arrays is more important than which particular style you use for the second panel. An inverse panel is basically the back of a full-depth normal panel. To flip a normal panel in reality, it would need to have been built to the full design depth, have no backboard, and have infinitely thin well bottoms. The following drawings show the sequence of steps to derive an inverse panel, using an N7 panel as the example. Step three: Replace the solid area with air, and the empty bit with the new panel (shown in brown). With the abundant diffusion from 2D panels, it is not likely that you would see this arrangement. A more likely situation is shown in the next image, which uses all one type of diffuser, built assymmetrically, and rotated where the alternate panel is required (fins not shown). Arrays of 2D panels look great arranged with ordered rotations rather than just random arrangements. Here are a couple of schemes used by Wes Lachot Designs using depth-optimised inverse N7's. Check out their site for some impressive photos! The yellow dots and black frames have been added to show the location of the zero-depth wells, highlighting the balance between periodicity and variety. When planning your installation, divide your available width by 25mm, or one inch. This will tell you the highest number of wells you can use. Divide this by four to find the number of wells per panel. Round this off to the first prime number that is smaller than your result to find the panel order. If this turns out to be less than seven, you need to use less than four panels. Diffusion lobes are created when a number of repeats of a periodic surface are placed together in a sequence. For multiple QRD panels, the number and angle of the diffusion lobes varies with the panel order and panel width, and the frequency and angle of incidence of the incoming wave. For a signal straight-on, there are usually three lobes at the design frequency, and at the HF cutoff frequency there are often the same number of lobes as there are wells. As the angle of incidence is increased, starting frequencies for each of the lobes decreases slightly for lobes on the same side of the diffuser as the incoming signal. Lobes on the other side shift to a higher starting frequency by a larger amount. The angle of the lobes also changes, as does their relative angular spacing. In addition, the apparent wavelength of the signal changes as far as the wells are concerned, leading to a lowering of the HF cutoff frequency. When the angle of incidence reaches +/-90 degrees, the HF cutoff falls to zero, meaning no diffusion. See the Lobes for multiple 1D panels page for full coverage of this complex topic. The fins are the walls between the wells, and run the full depth of the diffuser. Some cheap foam panels have the fins missing, but this lessens the effectiveness - leave them in. They need to be as thin as possible, whilst still being rigid. Apparently some early models used aluminium but then switched to wood, possibly due to ringing and cost. Normal timber, MDF or plywood all work well. Maybe even laminex would be a good choice. A: It depends on the usage. Here are some examples showing the difference between period width and panel width for different situations. When a panel is used in a sequence of panels, the right-hand fin for the last well is formed by the left-hand fin of the next panel. In this case, the number of fins per panel equals the number of wells, and the panel width exactly equals the period width. For a stand-alone panel, or for the last panel in a sequence, the missing fin has to be added. A small panel that is to be used as a well insert needs no end fins because these are provided by the walls of the surrounding well. See the "Fractal it" section further down this page for more on inserts. How bad is it really to leave out the fins? Below is the drawing shown earlier, demonstrating the huygens diffusion from a panel with fins. Underneath that is one without fins. You can see that the location of the re-radiating centres for the wells have shifted, plus the amount of phase shift introduced has changed. The arrows show there are different diffusion angles, and with some of the arrows roughly parallel, the intensity of the lobes has changed. The mathethematical balance that supports even energy lobes with multiple panels is gone. This is still a diffuser, producing shifts in both space and time, but it is no longer a QRD diffuser. Opinion only: The loss of support for even energy lobes is irrelevent for stand-alone panels. 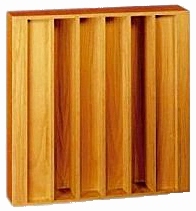 Some suppliers sell high-order panels without fins, and these are probably OK, provided they're used stand-alone. The panel should be made of non-porus material, with all seams properly sealed, and with no cloth over the openings. This will minimise absorption losses. To minimise weight, the bottom of the wells can be made using plates rather than a solid block that goes all the way to the backboard. Decware make a dual N13 kit that uses the neat trick of placing small blocks between the plates and backboard, thus setting the correct height and keeping the plates square. If you are using particularly narrow fins, you could minimise resonance problems by filling the voids with expanding foam. User "Moggie" at AVSForum built a whole heap of diffusors using this method. He found that expanding foam distorted the fins as it cured, so switched to rigid foam for the rest of the panels. Perhaps blocks to hold the fins during curing would overcome the problem. Check out the QRD part of the saga on page12 of his Home Theater build thread. Each step of the build has plenty of photos showing how it is done. Nice work! Use some glue-saturated cloth to strengthen the back of the seams. Another method is to use solid foam blocks to fill the well bottoms and face with thin timber. Xenon's QRD page has plenty of photos of this style of build. There really are some clever people out there. There was a mob called Soundscapes who sold a folded N=7 design to make it even thinner. Lighter too.. He makes some interesting claims about periodicity and efficiency that I would like to follow up when I have the time. Their flagship product is the Diffractal DFR-72, a 9 inch deep N7 diffusor which has a smaller diffuser inserted into the base of each of the wells. Since the extra wells are much narrower, the HF cutoff is lifted to the top of the audible range. The dimensions are the same as for their QRD-734 diffusor. They can even do custom installations with glass fins for those with super deep pockets. Soundscapes offers a similar design, presumably under licence. 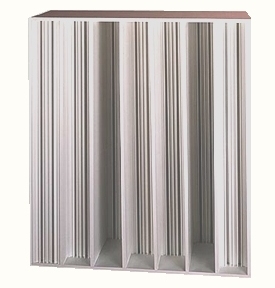 Opinion only: Since the well inserts are at different relative heights, their diffusion patterns shouldn't reinforce to produce the exaggerated lobing that a group of standard panels give. If this is so, no Barker-style modulation of the inserts is needed, and they can all be the same. Depth = (X^2 + Y^2 ) mod N ... where N equals the number of wells, with X and Y being the row and column position of the well. Lower-order 2D panels require fins, as shown in the above picture. As the order is increased, the complexity of the reflected signal allows the fins to be omitted. Whilst the exact mathematical purity of the device is lost, the scattering is still effecive. Standard inverse panels all have one well that is the full design depth, producing a phase shift of 360 degrees. When the panel is used to modulate a sequence of normal panels in a Barker-style" sequence, this well balances the shift from the zero-deth well of the normal (non-inverse) panel. The entire bottom layer can be dispensed wth, giving a shallower build,	or a lower design frequency. Higher order 2D inverse panels are often built without fins - the lone zero-depth well ensures that the panel is mounted at the correct depth. Modulation is common for 1D panels, but virtually never used for 2D panels, so the method is more applicable to 2D panels. Here is a comparison of the style of inverse 2D panels available. The centre panel is the mathematically correct panel. This is what would be required to use Barker-style modulation with normal panels (seldom used, if ever). The panel on the right is a finless inverse, which, whilst not a correct QRD panel, produces good diffusion if the order is large enough (say N13 or higher). The FRG omniffusor from RPG, uses the depth-optimisation method. Building QRD diffusers can be a massive amount of work. If you are not that into DIY, and have the funds, purchasing these products is the way to go. The following companies have made a great contribution to the understanding of QRD diffusers. If you are intending to use the resources presented here to produce diffusers for sale, note that some of the features detailed are patented by RPG, (Examples would be the half-width end wells, and of course, the Diffractal®). It would be good insurance to contact them via the above link to check on their licensing requirements. There's no point in giving the lawyers a free lunch! This free software can be used to design standard and inverse 1D and 2D QRD panels, plus the advanced 1D panels. See the QRDude page to download the calculator and to see the full feature list and user guide. Overviews on huygens and mandlebrot, plus the drawing of how modulation can decrease lobing. Diffuser performance analysis by measured-based modelling. Trevor is a Professor of Acoustic Engineering at Salford University, UK, and is the co-author of the book listed at the start of these references.